Permanent entry to animation with use in small wicker ( 2 hours in the morning and 3 hours in the afternoon ) . Children (from 6 years), teenagers and adults , each carries its realization.nimation à entrée permanente avec réalisation de petits objets en osier (2 heures en matinée et 3 heures en après midi). Pour enfants (à partir de 6 ans), ados et adultes, chacun emporte sa réalisation. 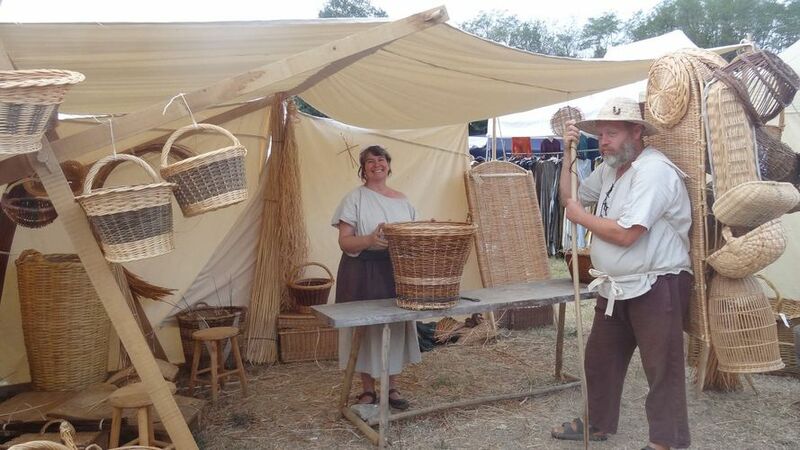 crafted during the event by visitors who can spend one or more strands to learn the art of wicker braiding. ( The basket made rest to the organizer at the end animation ) . all age groups. Wearing his baskets on the back as he wandered by challenging onlookers , as did the old village to village peddlers . Peasant of 3.50 m high, walked alternately with the peddler . Distribution wicker bracelets during parades. A discovery garden "How pushing baskets" for young and old . A basketry workshop activities with its collection of baskets and basketry from here and elsewhere. Two facilitators to guide your visits animations of school groups, after-school and adults .